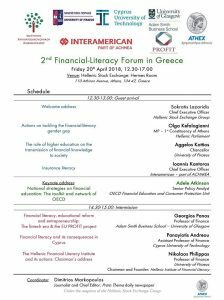 The Greek Institute of Financial Literacy, in collaboration with the University of Piraeus and under the auspices of the Athens Stock Exchange, holds its second congress on Friday, April 20 at 12:30 pm at the Athens Stock Exchange (Hermes Hall). This open event is part of the Institute’s actions to raise awareness on the increasing importance of financial literacy, as well as to implement the necessary actions to strengthen it, especially among the most sensitive social groups, such as pensioners, children, and immigrants. 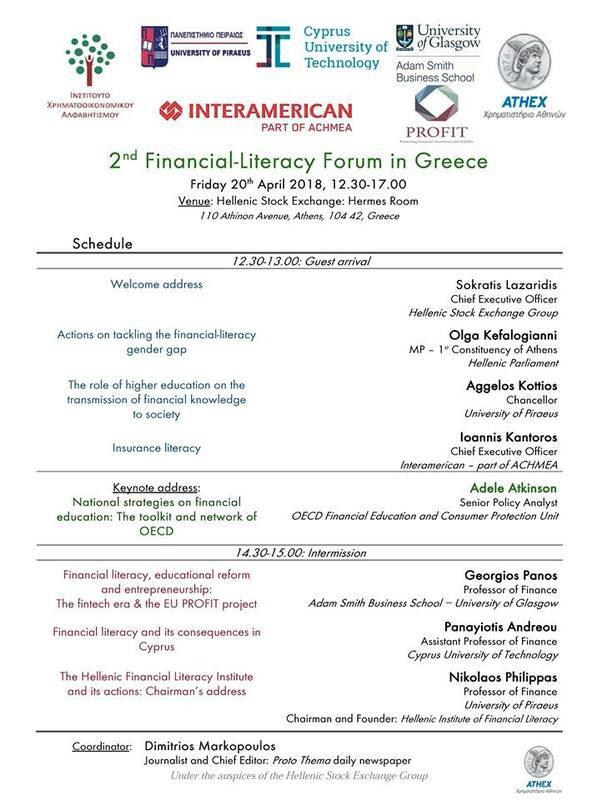 This year, the forum is going to have a strong international profile as a guest and keynote speaker is Dr Adele Atkinson, Senior Policy Analyst within the OECD Financial Education and Consumer Protection Unit, who will give a keynote address on “National Strategies for Financial Education and Related toolkit and the OECD network”. Prof. Georgios Panos, member of the PROFIT project consortium will deliver a presentation on “Financial literacy, educational reform and entrepreneurship: the Fintech era and the EU PROFIT project”. Participation is free upon prior registration via e-mail (to I.Deligianni@Athexgroup.gr, 210-3366262, Mrs. Iliana Deligianni). In order to enter the Athens Stock Exchange it is necessary to have your identity card or other official identification document with you. Please click on the image of the agenda to view it larger.